Another great day as we headed from Wanaka inland again and through another mountain pass, the Lindis Pass, which takes the road through the mountains and up on to a high plateau - this is what they call High Country. 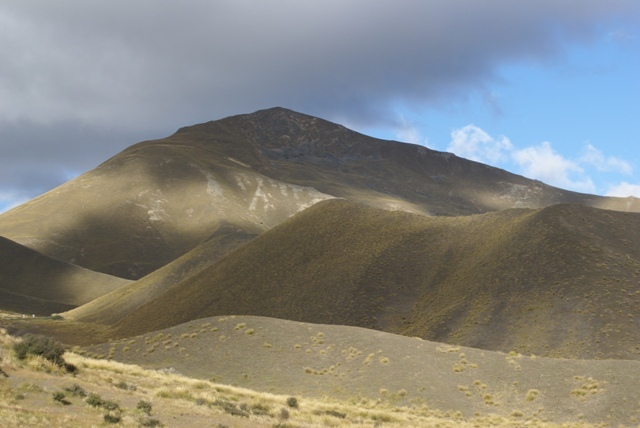 It's on the east side of the main Alps and so much drier and the rainforests have all gone and been replaced by golden tussock grass once again. It really is a dramatic change in scenery. 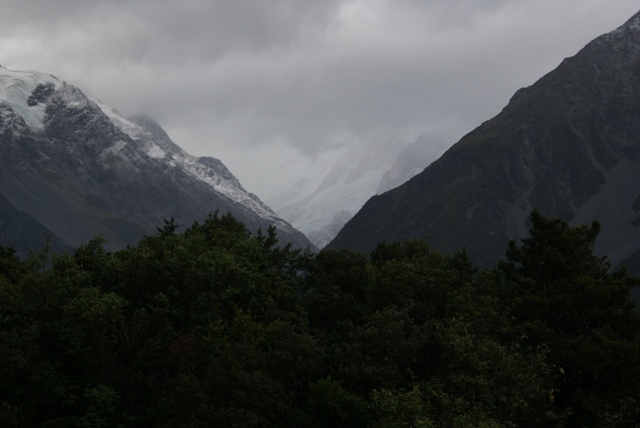 The target was to get to Mt Cook village to see Mt Cook from the other (east) side. 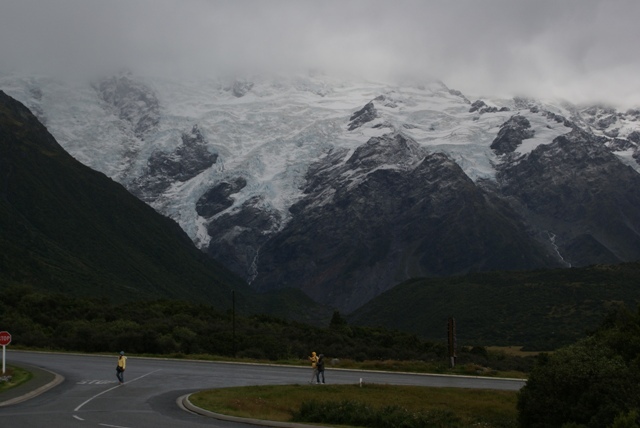 It is much closer and easier to view from the Mt Cook village side, but having seen it close up from the helicopter at Fox, and in bright sunshine, we wondered whether it was worth attempting to see it from the ground - could we get another clear day? The answer was no, but it was definitely worth the visit. 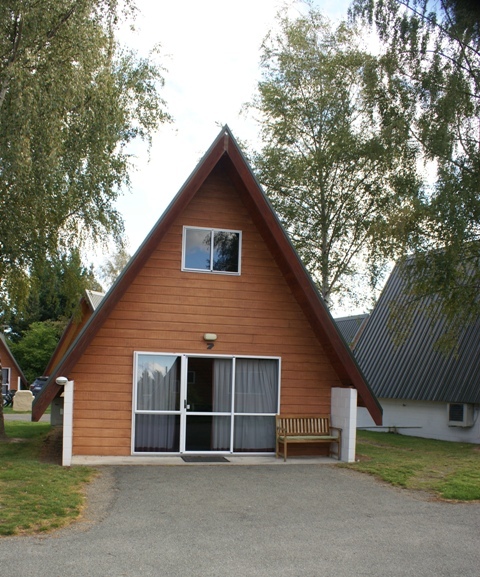 The motel had been booked in Twizel, on the way to Mt Cook village and about an hours drive away. So having checked in at the motel in bright sunshine it was off to Mt Cook village traveling along the side of Lake Pukaki. This is another of the high lakes and equally beautiful, being a lovely blue colour (as it's fed by melt water from the mountains) and surrounded by golden tussock covered mountains. 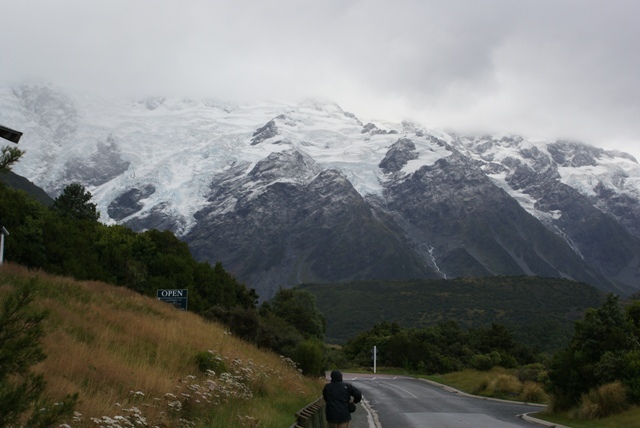 As you travel northwest along the lake, the mountains rise up to 10,000 to 12,000ft and form the snow-capped Mt Cook Range (Mt Cook is 12,316ft). Mt Cook village nestles in the mountains a few miles beyond the end of the lake. Unfortunately as we drove along the lake, so the weather turned from bright sunshine to low cloud and the mountains were shrouded in mist - creating a completely different atmosphere of darkness and foreboding, but just as spectacular and awe inspiring. 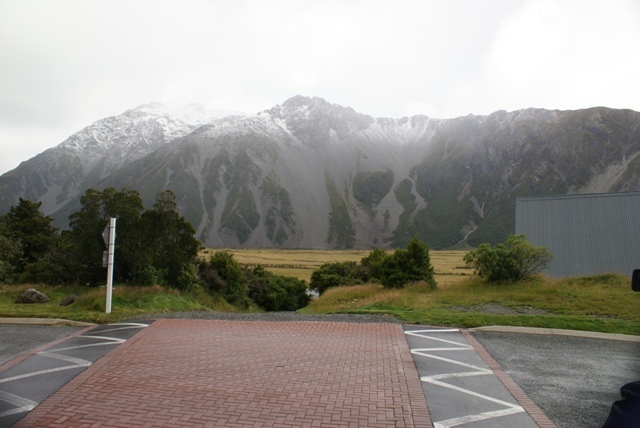 They have DoC (Department of Conservation) centres in many places in NZ - they provide tourist information and a background to the area, but the one at Mt Cook is by far the best we've seen. It's a modern museum in it's own right with great displays all about the mountains, e.g. 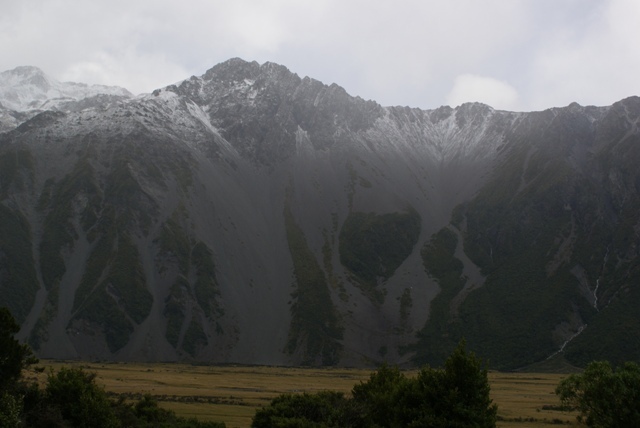 how they were formed and the history of climbing in the area. (Sir Edmond Hillary did all his training and preparation for Everest here.) It would be easy to spend half a day there just going round the fascinating displays. The DoC staff also provide information on the current state of the mountains and the walks that are safe and worth doing. 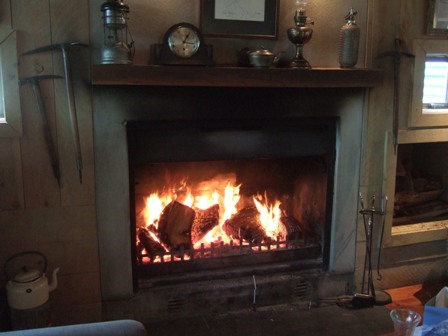 But being covered in mist, wet and down to 6 degrees C outside we made a unanimous decision not to go walking, but to sit by the log fire in the cafe and have a hot chocolate! 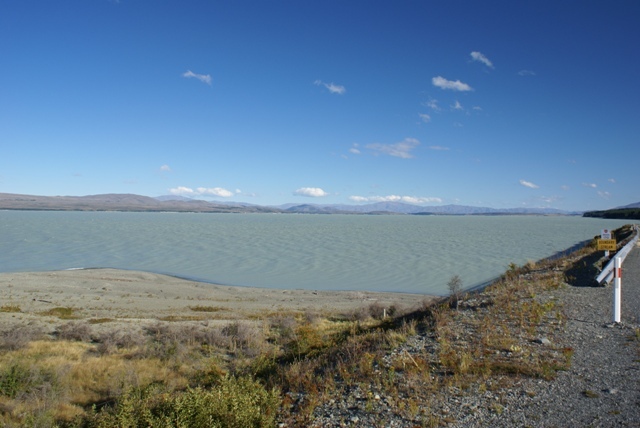 Having seen all that we could, it was back down the road along Lake Pukaki to Twizel and back into glorious sunshine once again. The scenery at the Lindis Pass and on the high plateau. 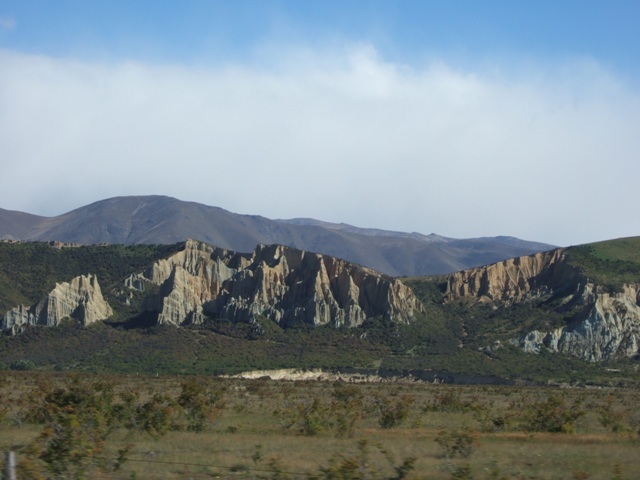 Clay Cliffs between the Lindis Pass and Twizel. Our motel room in Twizel - built for snow. Lake Pukaki in bright sunshine! 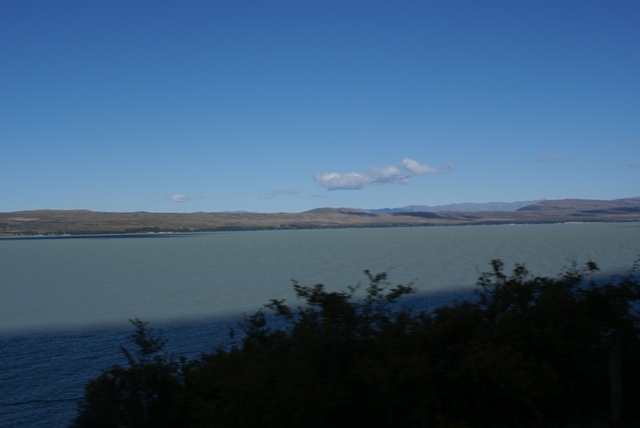 Further along Lake Pukaki - still bright sunshine. 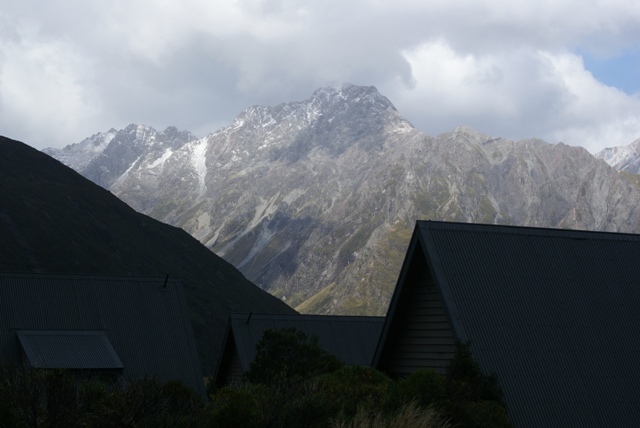 The view from Mt Cook village - the mist has descended. Looking the other way, as it gets darker. The village is tightly enclosed by mountains on 3 sides. Another view and a glimpse of sunshine. We can just about see the tops of the mountains in the foreground. 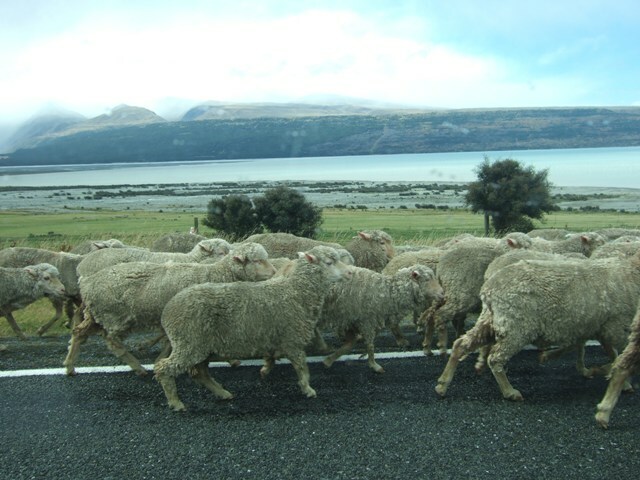 We think this is the way towards Mt Cook. We'll have to go back and check one day! ...... other than for a hot chocolate in front of the log fire!